Will Verizon launch Blackberry Storm on Nov 3rd? 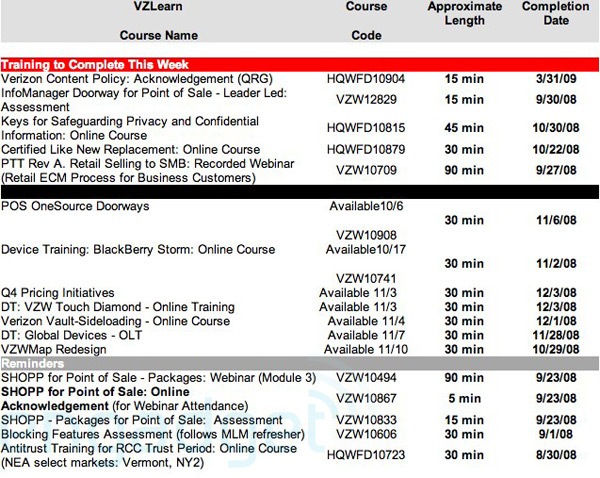 Could Verizon be launching Blackberry Storm on November 3rd? That is a possibility, based on the internal training document that Engadget manage to snag. According to this document, employees are required to complete the Blackberry Storm feature training by November 2nd. So, conceivably, Verizon could launch the Storm on November 3rd. However, I think the November 8th might be more realistic. Also, in that document, employees are required to complete their Touch Diamond training by December 3rd. So, Touch Diamond could launch few weeks before Christmas.